The Colon Towers (previously Jerez Towers) are two twin skyscrapers with 116 meters of height and 23 plants. They were constructed by the architect of Madrid Antonio Lamela and the engineers Leonardo Fernandez Troyano, Javier Manterola and Carlos Fernandez Casado. They have a structure suspended from two big props joined in the high thing by a platform, of which each of the plants hang both towers, by means of big girders perimetrales of six meters of singing, tightened with cables of steel. For his construction, first the foundations of concrete were realized on those who knelt both props and the top platform. Later the towers were constructed of above to below. From the top platform, they were bringing plant over after plant, to the base. To his feet, a body of three plants and six more the forged ones of basements. They were inaugurated by the name of Towers of Sherry, since they were the headquarters of the company Rumasa (of Jose Maria Ruiz-Mateos), in honor to the Jerez de la Frontera, original city of the managerial group. After Rumasa’s expropriation, the Government sold them in auction to the group Herón in 1986. The Insurance Mutual one Of Madrid bought the building in 1995. In the 90s, changes in the regulation did that one had to install a safety staircase between the towers. He took advantage, garnet to cover them for the second cap of crystal of color. A terrible mistake, aesthetically speaking. In the center, above was added the controversial plug of false Art Déco, to conceal antennas and machinery. The reform concluded in 1993. The architect Lick Her, recently deceased he was an author of the project. Also of the T4 of Cards, together with the Richard Rogers who designed the Center Pompidú of Paris with Renzo Piano. 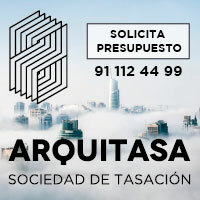 The Towers of Colon lodge companies and offices of representation, as the bureau Álvarez and Marsal, MCH Deprive Your Equity, Natixis, Legg Mason, M*G, BDO, the Commercial Office of Norway in Spain, the Organization of Exterior Trade of Japan, Hays, Bip and Drive and Tokyo Marinades, between others. In 2012, the interior of the towers was remodelled without removing his tenants. From the Plaza of Colon, we take any bus that crosses the Walk of the Castilian one and go to the Castilla Square. Headquarters IBM in Madrid (Spain) by Miguel Fisac, 1967. In our tour, we can see an unknown work of Miguel Fisac, architect author of the Church of the Dominicans in Alcobendas: headquarters IBM. The major difficulty of this building was consisting of eliminating the Sun in his front west. 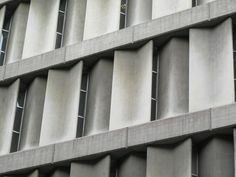 Fisac solved it by means of vertical prefabricated pieces of concrete of 2 centimeters of thickness you refill of insulating, guaranteeing the thermal and acoustic control. In the distance towards the Plaza of Castile, other actions exist as the building of The Union and the Phoenix. 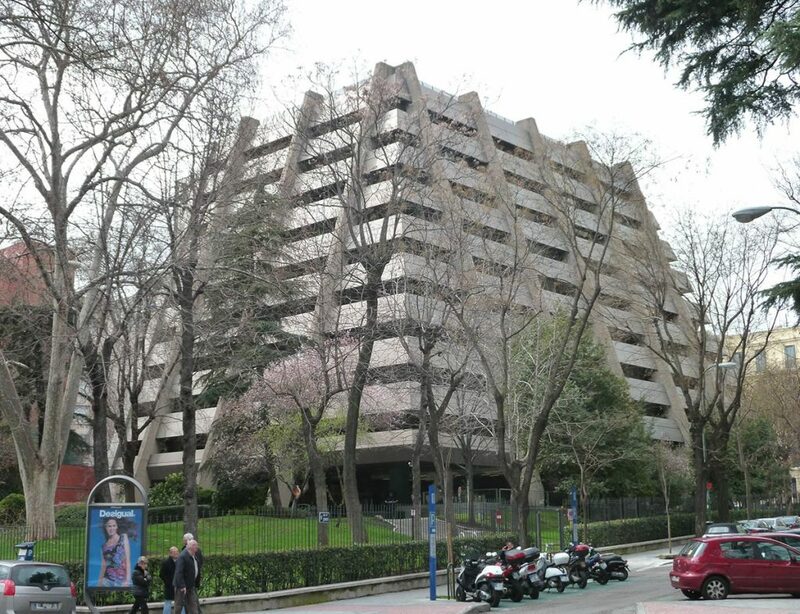 Projected in 1965 by Luis Gutiérrez Soto, it has about 28.000 m2.e the Castilian one and the back street. He presents a low set and a tower in height, to be adapted to the environment formed by the Walk of the Castilian one and the back street. The building with his black front of marble, has 19 plants and there is crowned with the sculpture symbol of the company that entrusted the project: The Union and the Phoenix. Nowadays it belongs to the Mutual Of Madrid one. It is surrounded with a grove where the authentic statue of the Bird is hidden, between the gardens, Phoenix. This statue, work of the French sculptor, Charles René de Saint-Marceaux, was the one that occupied originally the dome of the building of the Union and the Spanish Phoenix, corner of the street Alcala with the Great Route, until in 1972, the company sold the building to his current owners: the insurance Metropolis. Finally, the statue was replaced by other one that represents the Winged Victory, of Federico Coullaut Valera. The Pyramid building, which we see later, was raised on the areas on which there was raising previously the palace of the counts of San Bernardo. Many mansions, placed in the Walk of the Castilian one, as this one, have been knocked down, many of them with speculative maneuvers during the epoch of Franco. It is placed in the number 31 of the Walk of the Castilian one, doing forms a corner with Fortuny and Jenner. 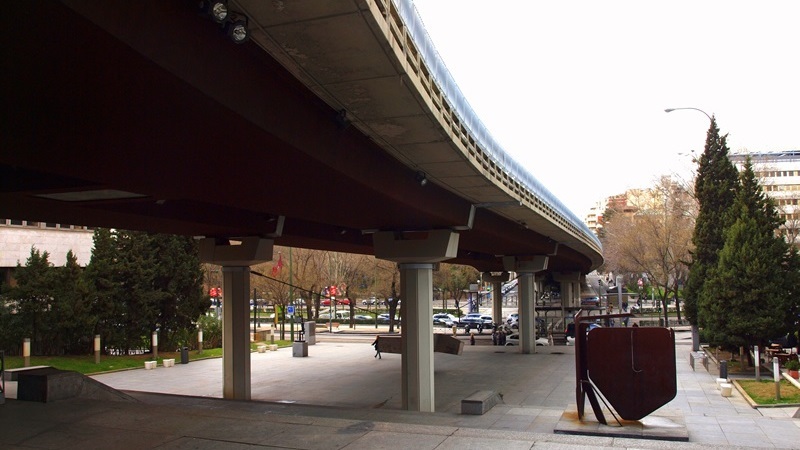 It was projected also by the architect Antonio Lamela Her in 1974. It has nine plants on low more four basements. Let’s go now to the bridge raised on the Castilian one, which joins the streets of Juan Bravo and Eduardo Dato, and where they find many masterpieces of the Spanish sculpture. The bridge called popularly as Juan Bravo’s bridge, it saves two hills that limit the districts of Salamanca and Chamberí. He was presenting two technical challenges: one, the existence of the step of the line of the meter under the walk of the Castilian one, the so called tunnel of the laugh. Other one was consisting of the fact that Rubén Darío’s station was not allowing the support of any type of prop on his vault. The project is a work of the engineers of ways Jose Antonio Fernandez Ordoñez, Julio Martínez Calzón and Alberto Corral. 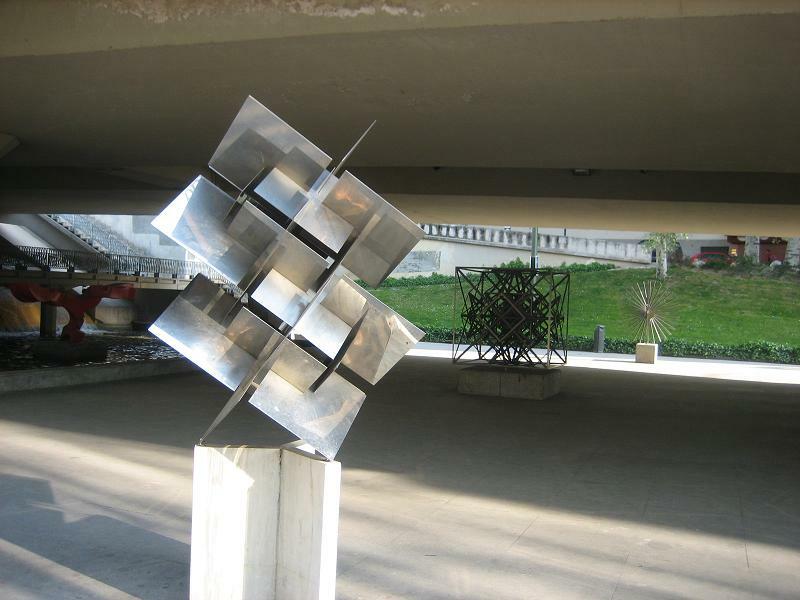 From the XXth it exhibits a museum of abstract sculpture outdoors that the engineers executed, with the collaboration of the sculptor Eusebio Sempere. The museum remained finished in 1978 with the installation of Chillida’s Aground Siren. This space was created as an exemplary way of bringing the modern art over to the citizen. The works donated by the artists, many of them were created specially for the enclosure, taking charge the Town hall of Madrid of the expenses of materials and installation. The official inauguration of the museum took place on February 9, 1979. In the year 1995, the movie History of the Kronen directed by Montxo Armendáriz based on the novel of the writer Jose Ángel Mañas, it has as dramatic scene the one that Juan Diego Botto and Jordi Mollà lead to be suspended from his rails. High bridge Enrique de la Mata Gorostizaga on the Castilian one (Madrid, Spain) of the engineers of Ways Jose Antonio Fernandez Ordoñez, Julio Martínez Calzón and Alberto Corral and Museum of the Sculptures outdoors. The museum occupies 4.200 m2, the majority of which are under the board of the bridge, existing to the sides a few landscaped zones. On him there is a small pedestrian crossing with equal rails to those of the rest of the bridge.